The Romaine project: a white elephant! 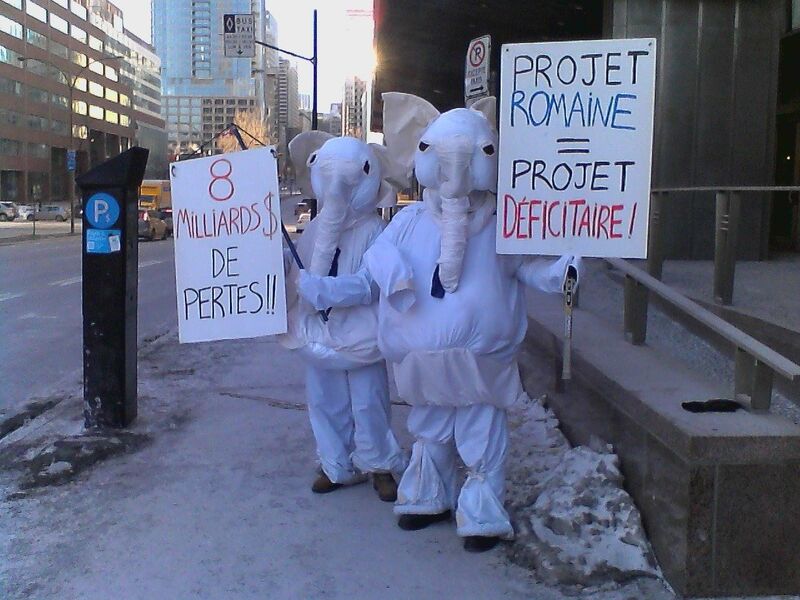 Since January 20, our hardy white elephant mascots have been picketing every working day in front of the head offices of Hydro Quebec, on René-Lévesque Boulevard, in downtown Montreal, to challenge a hydroelectric project that is both environmentally unsound and a waste of ratepayers’ money. Since 2009, the provincially-owned utility has been busy constructing a four-dam mega-complex, for a projected cost of eight billion dollars, on the impetuous Romaine River, a major salmon stream which flows into a National Park on the north shore of the Saint Lawrence near Sept-Îles. With an overall capacity of 1550 megawatts, this project is anticipated to generate electricity at a cost of 8.6 cents a kilowatthour (kWh). However as Hydro Quebec produces record energy surpluses and exports stagnate, it seems increasingly unlikely that the new electricity coming online from the Romaine dams will find a buyer. At best, a portion of the Romaine’s production may be purchased by aluminum smelters at prices varying between 3 and 4.4 cents a kilowatthour, which is the equivalent of half, or less, of what it costs the utility, and thus the ratepayer, to generate the electricity in the first place. (In reality, in recent years, Quebec-based aluminum companies have repeatedly deferred the expansions of their facilities which the Romaine project was expected to accommodate). It is to make up this shortfall that Hydro Quebec has applied to raise the electricity rates for residential customers by 5.8%, starting in the spring, effectively asking average citizens to subsidize a make-work project on the North Shore, which will benefit construction unions (that have received contracts for the dams) and possibly some aluminum and other energy-intensive industries, but which will damage ecosystems, undermine a commercial fishery, and attract no net revenue to the province. Alliance Romaine deplores this dilapidation of our common wealth to suit special interests. We are a environmental group committed to protecting the Romaine and Quebec’s other heritage rivers. With the Romaine project (slated for completion in 2020) now standing at the half-way mark, we believe vigorous public mobilization may be instrumental in forcing the cancellation of upper dams, and preventing the mistakes from the Romaine project from being repeated elsewhere. Alliance Romaine supports a portion of the budget now devoted to the Romaine project being reallocated to an economic stimulus and diversification program on the North Shore. We have invited Hydro Quebec to debate publically with us concerning the economic viability of this project. Our elephant mascots are on site in front of Hydro Quebec’s head office, at 75 René-Lévesque ouest, Montreal, from 8AM to 9:30 AM every business day, except on days when the morning protest has been rescheduled for a special event. On Thursday, February 6th, Alliance Romaine will hold a panhandling demonstration in front of the Hydro Quebec tower, from 11:30 AM to 1:00 PM. Come join us and have fun as we ask passers-by to contribute their spare coins to a money-losing project! Cliquez ici pour la version française de ce site.